This past May, Dr. Kristin Dixon returned from Nairobi, Kenya, along with education faculty Dr. Jennifer Kleiber and Corban education students Mary, Lily, Jessica, and Tenille. 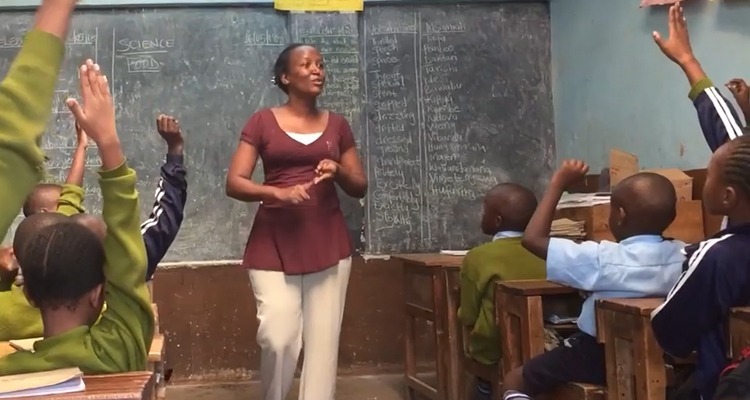 The purpose of the trip had been two-fold: students were given the opportunity to observe and teach alongside national Kenyan teachers, while faculty spent time observing teachers to support and encourage them and offer strategies to enhance the student learning experience. The opportunity to bring education students to Kenya first presented itself last May, primarily as a result of Dr. Dixon’s relationship with Missions of Hope International (MOHI), a comprehensive organization that has been providing education, healthcare, skills training, and more to the residents of Nairobi’s many slums since 2000. Dr. Dixon first discovered MOHI in 2009 when she was approached to review curriculum and assist with teacher training in MOHI schools. Since then, she has watched the organization grow to reach over 16,000 students in 22 schools across Nairobi and beyond. Although MOHI is a comprehensive organization, it’s largely centered around its K-12 schools. It’s these schools that have provided Corban education students the opportunity to test out their teaching skills in the classroom. Upon arriving in Kenya, students had two days to acclimate and attend a day-long orientation before arriving at 8am on Monday morning to teach. Students were handed the Kenyan standards book and assigned a classroom: “You’re in grade three. I want you to teach math, then I want you to teach English, then I want you to teach cultural studies.” And off they would go! When asked what kinds of feedback she would give, Dr. Dixon says, “A lot of the teachers are learning to be more student-focused.” In a culture that prioritizes oral lecture and direct instruction, teachers are increasingly learning how to keep students’ attention and engage them through activities and interaction with the material. Even something as simple as “Turn to the person sitting next to you and summarize what you just learned” can help engage a student in the learning process. Not every strategy an educator learns in the United States will apply in a Kenyan context, so Dr. Dixon, Dr. Kleiber, and Corban students had to be careful in their suggestions. “A national teacher might be in a classroom with 60 students, or 30 students sitting four on a bench,” Dr. Dixon says. An activity or manipulative that might be relevant may not be physically realistic. Yet despite inconveniences and challenges, whether in the classroom or in other aspects of adapting to a new culture, Dr. Dixon never saw students complain. “Both years, I’ve been really pleased that our students have risen above challenges.” Whether it was brushing their teeth with bottled water or using “hot water” that wasn’t really hot, she saw students not only absorb the experience without complaining, but even savor it. In addition to experiencing a new culture, Dr. Dixon hopes that students walk away with a new vision of the importance of education. “Without the opportunity of attending a MOHI school, these children probably don’t have much hope of a life outside of the slums. But this opportunity will literally change the course of their life, and probably their family’s life as well.” Her hope is that students return to America with a new appreciation for the power of education, as well as a broadened perspective on culture, the world, and how one organization is making a difference.